Rev.Dr. 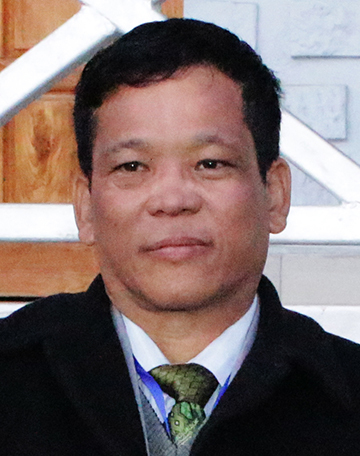 M. Thongkhosei Haokip, General Secretary. KBC is a semi-centralized, means the sharing of resources equally between the local church and the head quarter. The Convention which has its head Office in Imphal, It has a Pastorate system of Administration. The churches are divided into 19 Pastorates on the basis of geographical location, each Pastorate consist 5 to 20 local churches for administrative and Pastoral conveniences. Each pastorate is under the supervision and care of well trained pastors inducted into the Convention's Ministry. Moreover, there are 17 centralized Churches which we called Center Church, They are directly under the Convention's Aministration. They are under the supervision and care of a Pastors appointed by the Convention. With its humble begining Kuki Baptist emerges out of amalgamating of some Churches In 1958. But unfortunately not even before long a browl sprouted among the leadership and strayed with the early birth of Thadou Baptist Association. Followed by a semilar reason a secterian group formed again in 1965 with a branded new name Kuki Christian Church, rooting their different soil not to compromise back again in any unified end. When these scar marks only to be healed by the passage of time, the stream had come across another challenge that pierce us through with the same uncalled factors in 1974, and here its the Chongthu Baptist Association was formed again. Now a couple of decades was folded with many course of odds and evens. In 2011, few parts of the Convention has been mowed down by a crisis within and was given onother name Christian Methodist Church. But within off course, in 2014 August we have made our history a hallmark of Re-unifiying solution with this contingency of the recent one that was hard earned.